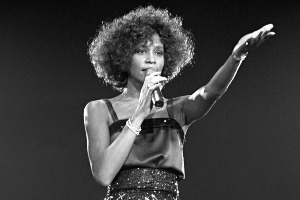 Whitney Houston was a very successful actress and singer. Between 1985 and 1992, she released four albums that together sold more 86 million copies. Whitney Houston was born on August 9, 1963 in Newark, New Jersey. Her mother Cissy Houston and her godmother, Aretha Franklin, were all big-time singers. Cissy Houston was the choir minister at New Hope Baptist Church. When Whitney was 15 she preformed with her mother trying to start her singing career. Also happening at the same time, she became the first African American women to be on the cover of 17 Magazine. But Whitney was more into music. Clive Davis helped start Whitney's music career. In 1985 Whitney Houston released her debut album and then she became really popular. The next year she had two really big singles named “Saving All My Love for You” and “How Will I Know.” Those two song's helped her album reach the top of the charts for 14 weeks. In 1986 she won a Grammy award for her song "Saving All My Love for You." A year later, Whitney released her second album and it went platinum. On February 11, 2012 Whitney Houston died. She was at the Beverly Hilton hotel in Los Angeles for a Grammy party. She overdosed in a bathtub and drowned. Whitney Houston was a very popular artist. People all over the world still listen to her music until this day.